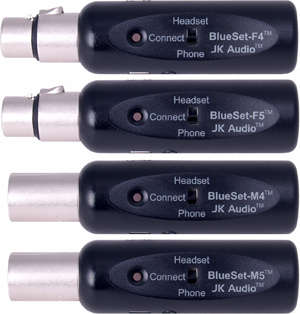 The BlueSet™ series of intercom headset adapters using Bluetooth Wireless Technology. These headset interfaces plug directly into most Party-Line (PL) belt packs, replacing the wired headset. A 3.5mm stereo headset jack contains a mic level output signal suitable for recording, with the beltpack headphone signal on the left channel, and the Bluetooth return signal on the right. Headset Connect: Leave your belt pack on the desk as you walk around the room. Some Bluetooth headsets allow you to switch between two phones, or in this case, switch between your intercom and your cell phone. Phone Connect: Pair BlueSet™ to your cell phone to extend your system around the world. The belt pack Mic/Talk button controls audio from the cell phone into the intercom system. 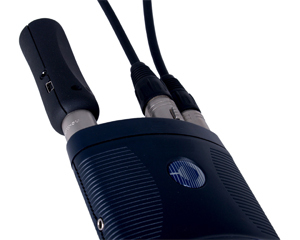 Intercom Headset Compatibility: Female and Male XLR four and five pin versions available: BlueSet-F4™, BlueSet-F5™, BlueSet-M4™, BlueSet-M5™. 3.5mm stereo, 1k ohms, 15mV RMS (-34dBu) nom.